Every winter, backyard birders look forward to possible bird irruptions that will bring new and welcome guests to their feeders. But what exactly is an irruption, why does it happen and what does it mean for birding? An irruption is a dramatic, irregular migration of large numbers of birds to areas where they aren’t typically found, possibly at a great distance from their normal ranges. This type of population shift can also be called Malthusian growth, in recognition of the population studies and analyses done by English cleric and demography scholar Thomas Robert Malthus. While one or two vagrant birds of northern species may appear at southern feeders in any year, an irruption is characterized by large numbers of unexpected birds. Depending on the species, irruptions may occur in cycles from 2-10 years, or they may be much more unpredictable. In any given year, there may be no irruptions, only one or two bird species may irrupt or there may seem to be crazy hordes of northern birds descending on southerly habitats. It is important to note that many winter birds will gather in flocks for the season, but that does not mean they are irrupting. An irruption is characterized by a distinct shift in the birds' typical winter range, with many birds appearing well outside the normal boundaries of their winter homes. Several factors can lead to irruptive years for different birds. The most common cause is a lack of food in the birds’ normal wintering grounds; famine can force large numbers of birds to seek more plentiful habitats until seeds, flowers and insects return in the spring. Birds that feed on the seeds and catkins of birch, maple, pine, spruce and hemlock trees often irrupt when those types of trees have poor seed crops. Different birds of prey may also irrupt when the seed crops are poor and cannot support the necessary rodent populations for raptor food sources. Other causes for bird irruptions include unduly harsh cold or severe weather that may force birds to find more temperate wintering grounds, or overbreeding that may deplete even plentiful food supplies. No matter what the cause of the irruption, however, it is difficult to predict where or when irrupting species may appear. The exact circumstances that can prompt an irruption for any of these species will vary, as will the scope of the population shift and where the irrupting birds appear south of their normal ranges. When songbirds and finches irrupt, they often do so in massive flocks, banding together in areas where winter food is plentiful. Raptors, however, remain solitary even in an irruption year, but record numbers of unusual sightings in unexpected areas can indicate an irruption of these northern hunters. When several species irrupt to the same region in one year, it is referred to as a superflight. Many birders welcome irruptions as an opportunity to see unexpected birds at their feeders. When large numbers of birds appear, however, diseases can be spread more easily and birders should take extra precautions to watch for illness. Cleaning bird feeders and bird baths regularly is essential to help keep irrupting birds and normal backyard flocks healthy. 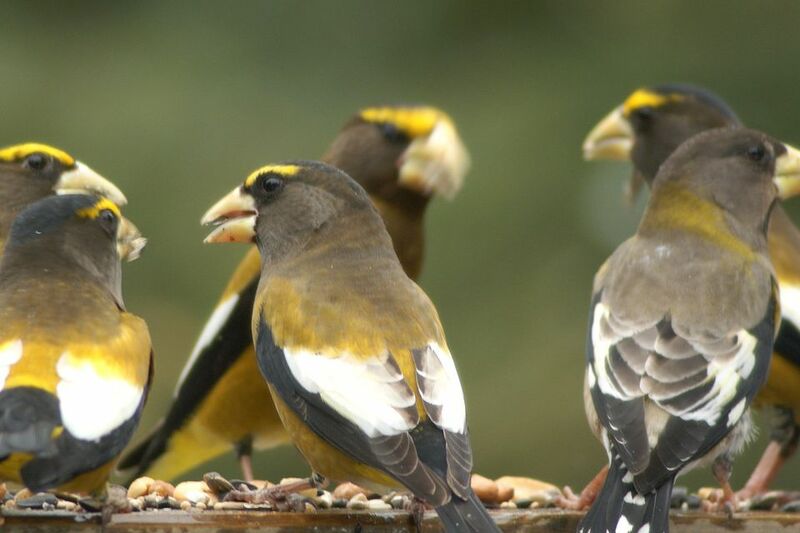 Large numbers of some irrupting birds may also bully or intimidate other backyard birds, restricting their access to feeders and monopolizing the seed. Birders can change the types of feeders and seed they offer to discourage such behavior, or they can put up extra feeders to welcome all the new guests to their yard. Spacing feeders out will minimize territoriality and aggression while ensuring that all birds can enjoy the buffet. At the same time, birders may want to investigate ways to save money on birdseed and other top winter foods, such as suet, to feed so many hungry visitors.